Two artists working as one since 1998. Added on June 11, 2017 by Adrian and Shane. ’All Together Human’ is a provocative one-day exhibition of protest art by Ireland’s leading creatives. Marking Irish AIDS Day 2017 (June 15th), proceeds from the sale of work will support the work of HIV activist group, ACT UP Dublin. The title, ‘All Together Human’ sums up the theme of this exhibit. Across our social, religious, economic and geographical differences, HIV – the human immunodeficiency virus – affects us as people. Altogether human in our weaknesses and strengths, our failures and achievements, our rage and joyfulness. All together, human, in solidarity, defiance and hope. Added on December 5, 2015 by Adrian and Shane. 5 layer screen print and spray paint on 300gsm munken paper. Hand signed and numbered edition of 30. Added on July 31, 2014 by Adrian and Shane. 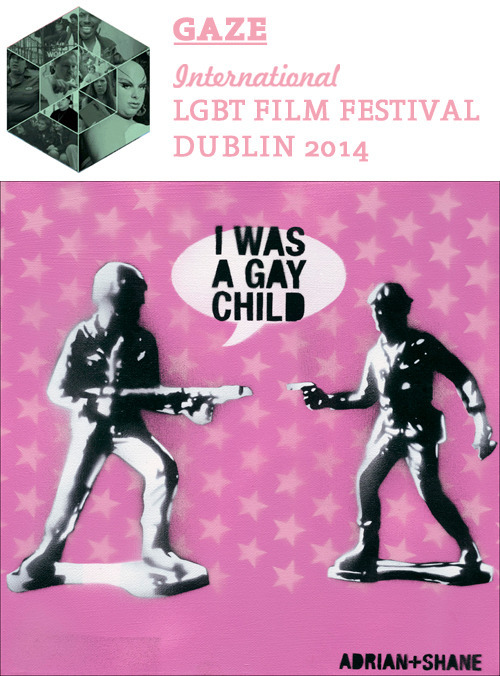 Adrian+Shane artwork exhibited at GAZE: International LGBT Film Festival in Dublin. "To coincide with the festival we have invited a number of artists to create work that relates to this year’s festival theme – ‘The Power Of Our Stories’." Curated by GMIT Graduate, Matthew Sutton, the exhibition features work from up and coming graduates and contemporary artists from a multi-disciplinary background. The exhibtion will hang in the Front Lounge, Parliament Street for the month of July and will then make its way to the Light House Cinema for the duration of the festival. Limited edition prints are available for sale via the online shop.